"Alright. I'll get you the Batman's cape and cowl. That won't be difficult. He is only human after all." Run Time: Approx. 624 min. Batman: The Animated Series is one of those shows I watched when I was 12, but never really appreciated until I was old enough to understand what a singular achievement it is, a superbly crafted, strongly written �children�s� program that doesn�t talk down to kids and is just as rewarding for adults. The early �90s series carries over the dark, brooding flavor of the Tim Burton Bat-films, but rounds out the package with a stronger comic book sensibility (art deco angles and retro style meets modern technology) and writing more concerned with character than chase sequences (though there is plenty of great action, too). As did Volume One, this set collects 28 episodes of the series on four DVDs. Standout episodes from this second batch (not really a second season, as the show aired daily and the first year consisted of 60-odd installments) include some of my favorite Joker episodes, invariably scripted by series stalwart Paul Dini and aided by Mark Hamill�s pitch-perfect vocal take on the clown price of crime. There�s Joker�s Wild, in which the villain takes offense to a themed casino profiting from his likeness; and his attempts to patent a product that makes fish look funny (yeah, kinda weird, but he�s a psychotic clown, so go with it) in Laughing Fish. The Joker and other members of the Rouge�s Gallery, including Poison Ivy, Two-Face, and Killer Croc, also appear in the Dini-scripted Almost Got �Im, in which the villains tell stories about the bat who barely got away. Two two-part stories feature some of the series� most involved plots: In the Emmy-winning Robin�s Reckoning, the Boy Wonder (whose animated origin story is told for the first time) walks the line between justice and revenge when Batman tracks down the man who made him an orphan, and in Heart of Steel, the Caped Crusader must unravel a plot to replace Gotham�s VIPs with ultra-realistic robots� including a virtual Bruce Wayne. I'm also quite fond of The Man Who Killed Batman, in which a lowly criminal thinks he has finally killed the hero. Instead of being celebrated by the supervillains, though, he becomes a target�seems the Joker liked having ol' Bats to kick around. The set also includes the first appearances of villains like Ra�s Al Ghul (Off Balance) and the Riddler (If You�re So Smart, Why Aren�t You Rich? ), and in every instance, they feel like they�ve been plucked right out of the pages of the comic books, The voice acting is all around excellent, with such familiar talents as Adrienne Barbeau, John de Lancie, and Robert Picardo making the roles their own, and, as always, Kevin Conroy lending a dark humor to the title character himself. On the technical side, the series fares well, though the increased clarity of DVD, or maybe simply increased scrutiny, reveals occasional imperfections in the source material, but overall, the show looks great aside from a slightly grainy appearance. The audio is presented in 2.0 surround mixes that present dialogue and effects clearly across the front soundstage, with, as with most TV releases, minimal support from the surrounds. Extras Review: Warner Bros. has produced a fine set of supplements for this second release in the series, a package that will appeal to youngsters and, more so, to adults, the series� real audience. The creative team contributes commentary tracks to four key episodes: Producers Bruce Timm and Eric Radomski appear on Robin�s Reckoning: Part One (an Emmy winner), and are joined by director Kevin Altieri on Heart of Steel: Part Two, writer Paul Dini on Almost Got �Im, and director Boyd Kirkland on Harley and Ivy. All for tracks give you a good idea of the �round the clock work that went into the series, and the passion the artists and writers brought to the project. The track with Dini is my favorite, as he focuses on writing great scripts that are faithful to the comic, but all are worth hearing. 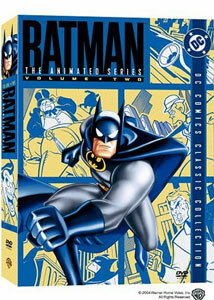 The first three discs also include short featurettes that examine the world of Batman: TAS. Robin Rising (8:00) discusses how the writers molded the animated Robin from decades of comic book backstory. On Disc 2, Gotham�s Guardians (10:00) focuses on the supporting �good guy� characters who help out the Dark Knight. And finally, you�ll find Voices of the Knight (8:00) on Disc 3, a fairly standard voice acting featurette similar to the one found on the episodic release Batman: Legend of the Dark Knight. The set is very well produced, with attractive menus and great packaging�a slipcase covered with a rouge�s gallery of Batman�s well-known nemeses, illustrated in the rough style of old newsprint, with a raised, molded image of Batman himself throwing a punch. Last year, fans clamoring for season sets of Batman: The Animated Series got their wish, and Volume Two is another great installment. One final release will likely complete the series� initial run of 85 episodes, clearing the way for the release of stylish, redesigned follow-up Gotham Knights and future world Batman Beyond.